Looks like Larry Hoyle is expecting a major mosquito war. 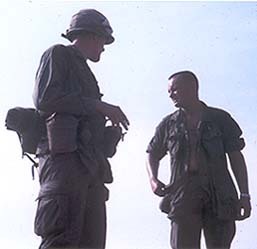 Introduction Larry Hoyle, another 2nd Platoon original member, who was also drafted on May 17, 1966 and joined the 9th Infantry Division as it was reactivated for combat in the Mekong Delta. I grew up with Larry and his twin brother Berry in the Antelope Valley of Southern California. While growing up, we did a lot of really stupid things and were fortunate to have survived adolescence. 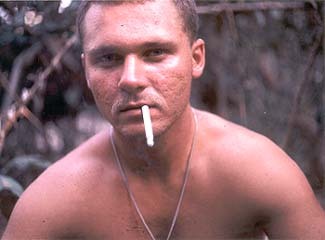 Berry ended up in Germany while Larry and I went to the 9th Infantry Division at Fort Riley, Kansas. There were about nine of us drafted from our area at that time and most of us ended up with the 9th - all of us became very good friends as some of us previously knew each other. each other. Mike and Larry had a terrific phone conversation reminiscing about their good ole days spent together at Fort Riley's beer hall listening to "California Dreaming", "Monday, Monday" and "The SLoop John B". Most of the Southern California guys hung out there. They also discussed meeting each other occasionally as many of us "Old Reliables" are doing these days. 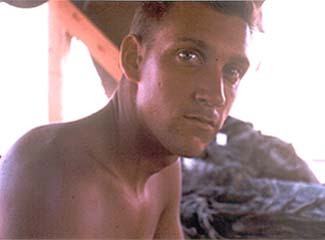 Larry said that he must have been blessed by God because after he transferred from the 2nd Platoon, approximately July 1967, he was sent to a 4th Infantry Division fire-base camp near Pleiku. 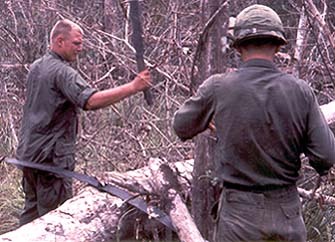 The next day, he was moved to another fire-base camp and within a very short period of time, the Viet Cong suddenly launched a major siege on both base camps. 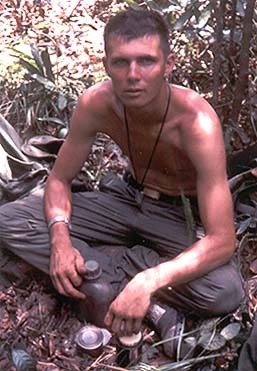 His base camp suffered many casualties while the other base camp was overrun and suffered 80% casualties. Yes indeed, Larry Hoyle is truly one blessed man. trooper. Anyone recall "the letter"......? 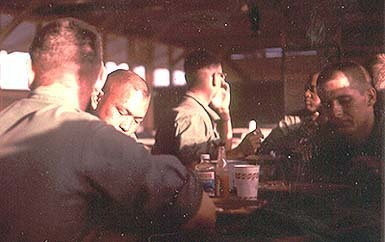 really fine c-ration meal during a break on patrol. on the left and John Young to the right. from Florida - 2nd Platoon troopers. 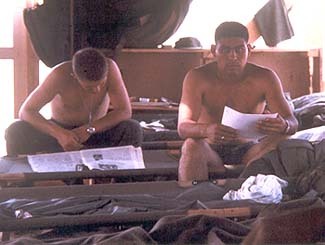 luxurious U.S. Army issue tent - Dong Tam, South Viet Nam. San Fernando Valley (north of Los Angeles, California). Here's our buddy, Marion "Butch" Eakins from Edelstein, Illinois. 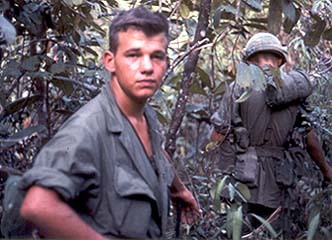 3rd Platoon troopers pinned down in a rice paddy - July 11, 1967. Eakins, Phil Ferro, and Harold King July 11, 1967. 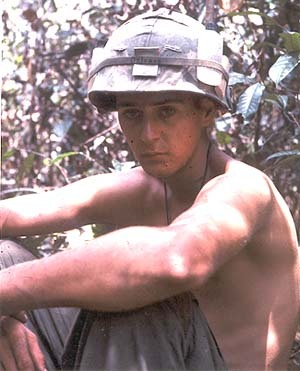 3rd Platoon's Fred Kenney also died in that battle. 2nd Platoon troopers crossing another stinkin' river in the wet and muddy Mekong Delta. 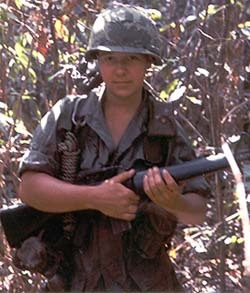 There's Frank Schwan carrying his M-60 machine gun.